With fall closed out, here are some tasks to help prepare for and endure what comes with winter on the interior and exterior of the home. Snow Removal - it usually pays to make preparations for accumulations for snow, depending on your location. Some situations are best for a snow shovel, others automated equipment, such as a snow blower or lawn/tractor mounted blade. For more details refer to our snow removal tips. Gutters - as a preventative measure, it is great to have gutters that are secured with pop-out clips, rather than nails or screws. This will make the gutter generally less likely to bend and deform from stress of a snow load & ice. When the clips are released, if you have these, after the load has gone the gutters are pressed back in place. One thing to keep in mind before having new ones installed! 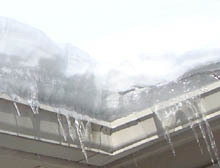 Roof - to prevent leaking of water due to melting snow, from that of ice damming, and, based on factors like the home's ventilation system, roof type and structure (although other factors contribute) - some roofs may be candidates for roof warming cables. But installation along with monitor should be left to the pro's. Attic - check for adequate type and amounts of insulation to prevent air loss into the attic space. And that code requirements are met. - Some homes developing large icicles may signal internal heat loss. Exterior Trees/Vegetation - be cautious of trees prior to carrying a snow load combined with potential wind. Spot trees and limbs that might impact the house or other structures. Delicate trees should have a buildup of snow removed from their limbs to prevent breakage. Decks & Attached Areas - remove snow buildups for either the weight or the melting if it might infiltrate behind the siding/shell of the house - before going into the wall cavity and into the floors. House wrap barriers typically aren't designed for prolonged exposure to moisture conditions. Never take unnecessary risks. Windows/Doors - all air leaks should be adequately sealed prior to the onset of cold temperatures. See how to seal exterior doors. Propane Tanks - check for proper levels of gas and for any backups if needed. If in doubt as to their levels or for any questions on operation, contact your local authorized dealer. Realizing that it is sometimes easier to replace tanks, especially larger ones, before much snow or severe temperatures arrive when some dealers become flooded with calls. AC/HVAC - if there is a heat pump system, know the temperature at which the pump kicks in at, for those concerned about the consumption of electricity. Replace or clean the furnace filter if needed. Also be aware of the latest hot water heater, drain and clean. Normally it's efficiency has much to do with the electric. Garage - keep garage door lower seals free of snow and moisture, that can freeze and seize up the door. Outer entry doors may need adjusting. Fireplaces - keep the proper damper ventilation. Wood burning fireplaces might need swept. Laundry - dryer machines add heat when the temperatures drop, but be sure that the exhaust duct is vented and sealed as it should be. Remove builds of lint in the routing of the duct as well as in the machine. Lint blockage not only causes slower drying it can definitely present a risk.